The name "Ben-Tehillim" is a Hebrew pseudonym, it means "Son of the Psalms". Based on handwritten comments in one copy the actual author may be Dr. T. W. Chambers of New York. 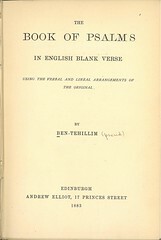 According to another explanation the author is an Englishman or a Scotsman as he mentions in the preface that any communications to his translation would be much esteemed, and that »these may be addressed to my assumed name Ben–Tehillim, care of Mr. Andrew Elliot, publisher, 17 Princess Street, Edinburgh.« It is not likely that an American translator cares about the chanting of Psalms in the Prayer Book Version of the Church of England (see Preface) and tries to attempt better results with his translation. For sample verses from the Psalms in English Blank Verse, click here. Comment: Clothboard octavo with sewn binding; VIII & 190 pp. Scripture text printed verse-wise. Verses numbered, Psalm headings not translated. No annotations and cross references. 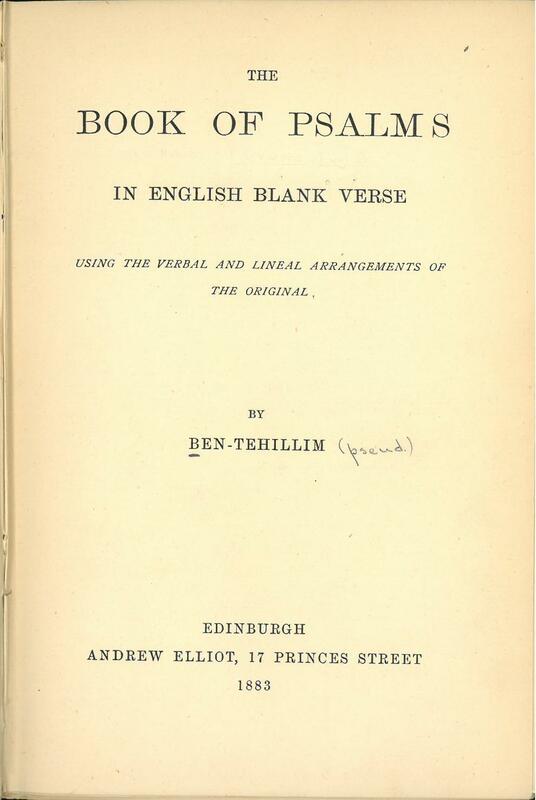 In his preface, dated December 15, 1882, Ben Tehillim writes: »Much attention has lately been given to the Book of Psalms, and a growing desire has been shown to chant the Authorized Version, as the Church of England chants the Prayer Book Version. Evidently, however, the two modes in which the Church of England uses the Prayer Book Version are both very faulty. (…) Therefore the thought presented itself, Is there no possibility of attaining a better plan? Let an attempt be made.« Chief alterations have been made in translation (against the A.V.) in many chapters.